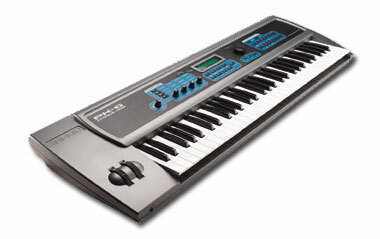 The new PK-6 Proteus Keys is a sleek keyboard with E-mu's Proteus 2000 sounds and features. The PK-6 comes with the Proteus's 32 MB "Composer" soundset, and additional Proteus expansion ROM soundsets can be added up to 128 MB. The sounds cover the whole spectrum of synthesizer type sounds, from real instruments to bizarre sounds and effects. The keyboard is a full 61-keys long with 16 real-time controllers. There's also 16 on-board syncable/programmable arpeggiators and the Proteus 2000's Super BEATS interactive Groove Mode. With 16 mute/enable buttons this keyboard is set for live and on the fly performances with plenty of real-time controls! Unlike the Proteus 2000 which is 128 voice polyphonic, the PK-6 has just 64 voices and only 4 audio outputs as opposed to 6 in the rack modules. The PK-6 also features multi-mode resonant filters, 24-bit DACs, and an affordable price tag! The PK-6 is part of a new line of performance keyboards launched by E-mu that repackage their current line-up of top notch sound modules targeted at specific genres. For all purpose synthesizer, the PK-6 Proteus Keys. For HipHop and R&B, the MK-6 Mo'Phatt Keys. For techno trance and dance, the XK-6 Xtreme Keys. And Halo from Ensoniq, which is another all purpose synthesizer.